Salesforce Ventures, the VC arm of the $50 billion cloud software maker, has suddenly cut back its spending, after establishing itself as one of the most aggressive corporate VC firms in the past couple years. According to Salesforce’s latest quarterly filing, the company only spent $22 million in “strategic investments,” which is mostly tied to Salesforce Ventures, marking the lowest spend since the October 2014 quarter. 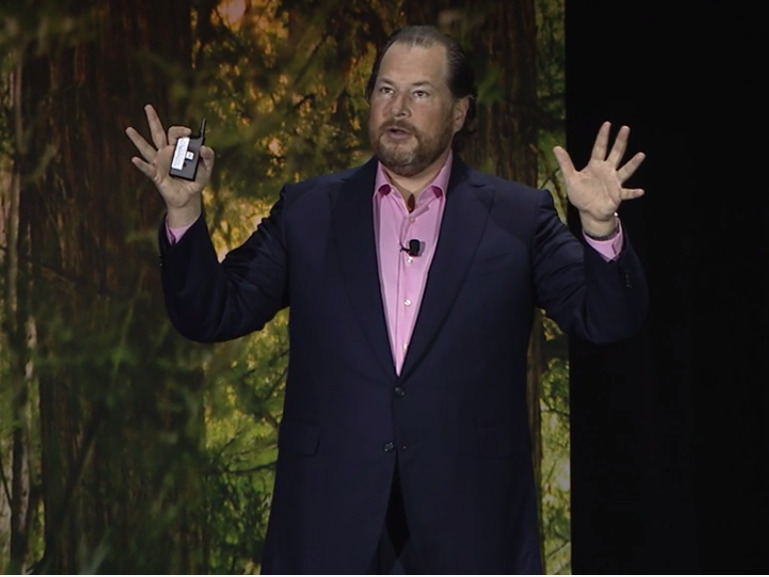 It’s a big step down from the same quarter of last year, when Salesforce spent $144.4 million in strategic investments, and a total of $366.5 million in all of 2015. The slow down in Salesforce Ventures’ spending is yet another sign of a cooling VC environment that’s been developing since late last year. Investors have become much more conservative with their money and startups are finding it harder to raise funding at their intended valuations. Instead, big companies like Salesforce have shifted their focus to the M&A market, accelerating their pace of acquisition in both the private and public markets. 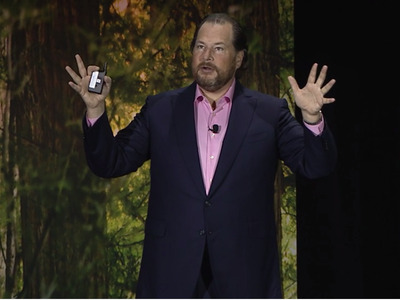 Salesforce’s strategic spending started to taper off in the third quarter of 2015. After spending $144.4 million and $150.4 million in the first two quarters of 2015, it dipped to $30.3 million and $41 million in each of the two subsequent quarters. In the first quarter of this year, Salesforce not only reduced its strategic investments to the lowest level in nearly 2 years ($22 million), it also saw the fair market value of its portfolio companies drop for the first time sequentially. The growth of its fair market value hit the wall this quarter at $706.9 million, after going from $215 million in the July 2014 quarter to $714.1 million in the January 2016 quarter. Some of the change has to do with the liquidation of YOUR SL and Steelbrick, two companies Salesforce had invested in and bought recently. Since they have been acquired, they’re no longer included in the fair value of Salesforce’s strategic investments. But a big part of it likely has to do with the broader market downturn. Some of Salesforce’s largest portfolio companies, including Dropbox, DocuSign, and Evernote, saw some form of mark downs by hedge fund investors in recent months, a sign that they may not be growing as fast as they used to. Salesforce works with internal and third party accounting firms to assess the fair value of its private investments, but also takes into account the market valuations by other investors. 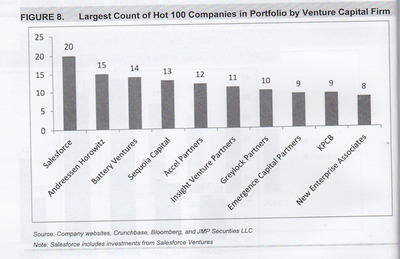 JMP SecuritiesSalesforce Ventures has been one of the most active investors in the cloud software space lately. That doesn’t mean Salesforce Ventures is getting out of the game any time soon. It has made a similar number of investments this year as in prior years, while recently launching two separate funds — one for Europe and one for startups building on Salesforce’s own Lightning platform. The reduced investment dollar amount may simply have to do with a lack of opportunities in the mid to late stage startups, which typically draw larger funding, and slow returns, as the tech IPO market has been nearly nonexistent this year. Salesforce told Business Insider that it’s more focused on smaller deals these days. “We focus our investments on the companies that we believe are most strategic and will extend Salesforce — and recently, that has been in early stage investments where companies raise smaller investment rounds,” the company said. On the flip side, as Salesforce slowed its VC spending, the company’s become much more aggressive on the M&A front. Right as the company reduced its VC investments in the third quarter of last year, Salesforce started scooping up companies, including two mega deals for Steelbrick and Demandware, for $360 million and $2.8 billion, respectively. Salesforce has bought 7 companies since the third quarter of last year, after only buying 6 in 2014 and 2015 combined. Salesforce seems to find the large M&A deals more attractive now, but Menlo Ventures partner Matt Murphy believes it’s a temporary change, as a lot of cloud software company valuations have been compressed lately. He sees Salesforce’s VC activities eventually picking up again.